Trump administration orders two big corporations to pay for a $115 million cleanup at a Texas toxic waste site that may have spread dangerous levels of pollution during the flooding from Hurricane Harvey. WASHINGTON (AP) — The Trump administration has handed a rare victory to environmentalists, ordering two big corporations this week to pay $115 million to clean up a Texas toxic waste site that may have spread dangerous levels of pollution during flooding from Hurricane Harvey. 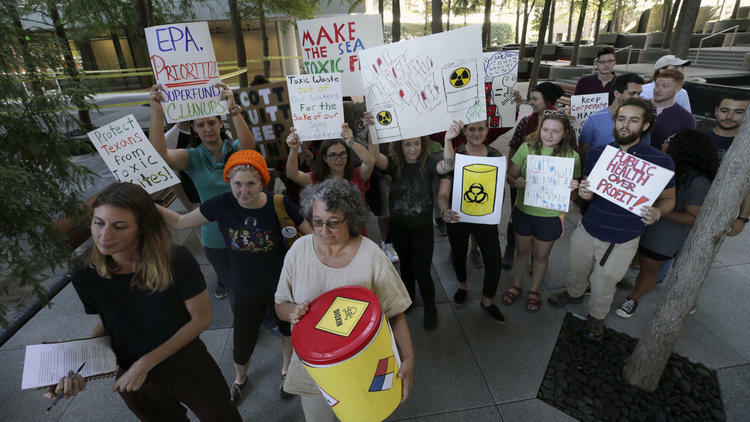 At the waste pits, both companies opposed the expensive cleanup, arguing that a fabric and stone cap covering the 16-acre site was sufficient. The former site of a demolished paper mill that operated in the 1960s, the island in the middle of the San Jacinto River is heavily contaminated with dioxins — chemicals linked to cancer and birth defects. A sample collected by an agency dive team from an exposed area at the site showed dioxin levels at 70,000 nanograms per kilogram — more than 2,300 times the level set to trigger a cleanup. Dioxins do not dissolve easily in water but can be carried away with any contaminated sediments and deposited over a wider area.